Down & Dirty: inspiration or makeover? Fellow blogger Gardener of La Mancha posted some photos of the Northern California coastline where he's living these days. He made the connection between the rocky coast and a classic, Japanese dry garden, and that reminded me of the sharply jutting rocks I loved on the northern coast of Okinawa. 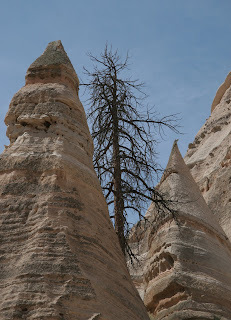 Then there are the tent rocks here, in northern New Mexico. All of this has got me thinking about finding inspiration in nature and my garden philosophy (thanks Sara and G of La M). I attended a lecture two weeks ago. The speaker was extremely accomplished, but I didn't enjoy his work. Rather than complement or acknowledge the surrounding geography, he creates massive replicas of features (water, stone) that seem out of place. Perhaps this is a knee-jerk reaction to the enormous sums of money I know it costs to build a cliff where there isn't one, or to install a 3 acre lake in the middle of a field. Regardless of the cost, I prefer to work with the natural landscape rather than imagine I can drastically improve its shape and composition. I'm all for drawing inspiration from nature. In fact, I use upright stones in my own garden. But there's a difference between inspiration and a complete makeover, don't you think? For excellent examples of how local landscapes can inspire gardeners in a way that works with nature (not against it), see two books by Scott Calhoun: Yard Full of Sun and Chasing Wildflowers. I recommend them both. I agree completely. Gardens that take nothing from the surrounding landscape and require too many artificial structures are not only expensive to create and maintain, they have an atmosphere of too much human intervention. I prefer gardens that are a collaboration between humans AND the rest of nature. That's how I feel about my garden in Bayside; it's way more "nature" than me. I've just posted an elaboration on my garden philosophy, and I hope to keep going with these thoughts. Beautiful pictures, Ellen. Did you get a chance to see any dry gardens during your trips to Japan? I've spent the last few years planting my garden with remembered favorite plants from the northeastern woodlands. They're all happy in my Brooklyn backyard (they're native here, as well), but there's no illusion that you're miles from nowhere. I wonder, though, if I suddenly found myself living in a totally different climate/habitat... would I be tempted to reserve a corner for some of my old friends? Would it take a while for my esthetic to adjust? And not just my esthetic - in a totally different climate, I'd have different kitchen-garden plants, so my cuisine would have to adjust, too. A lot of the "makeover" mindset is simply thoughtless, but maybe some of it is nostalgic, or migratory. Do you ponder this, when you imagine living in Santa Fe? I think of it every time our Oaxaca fantasty comes up for discussion. Gardener of La Mancha, I heard Doug Tallamy speak 2 years ago - it set me off on a whole insect adventure in reading and gardening. I haven't read his new book yet, but will. And thanks for sharing your philosophy. I've been working on articulating mine. I easily see "that's not it" - it takes more work (of course) to say what I mean. Interesting question, Sara. Honestly, when I'm in Santa Fe I'm beguiled by all the things they can grow there that I can't grow here, but I suspect I'd always want a few old friends in my garden. But I promise to never create fern-lined, babbling brook in the baked clay of the high desert. Yes, there's a big difference between leaving a corner of your garden for a sentimental favorite (or several) and installing a gigantic fake waterfall! Of course part of the reason you'd think of living in a place is... the place itself.